Do you have an older generation machine that can't boot from a CD-ROM and you would like to create a set of boot disks using your Mac OS X machine with a USB floppy drive? I did, and to spare you the trouble (and to help myself remember for future reference!) here's how to do it. Firstly go grab yourself copies of the .flp floppy disk images from the FreeBSD FTP server. Obviously you plug in your 1.44MB USB floppy drive in, then stick in a blank disk. Even if you're pretty sure the disk is blank it's a good idea to format it anyway to help detect bad sectors which can really screw up a FreeBSD installation (which can be really fun if you have other partitions with data on it!). 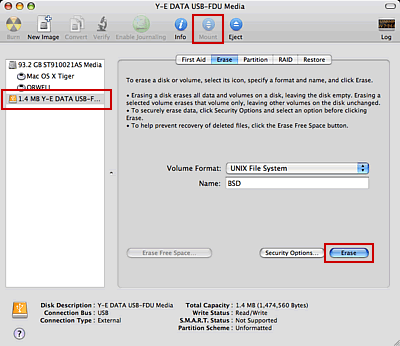 Fire up Disk Utility in /Applications/Utilities/. All good so far. If you get any errors during the process, most likely you have a dud disk. Just replace it and try again. Now to make the disks. Basically you can follow the instructions in the FreeBSD Handbook, but instead of pointing to the "/dev/fd0" BSD device, point it to "disk1". Go to your trusty Terminal also in /Applications/Utilities/. Punch in dd if=DISKIMAGE.flp of=/dev/disk1, replacing DISKIMAGE with the image you’re using. Good luck! 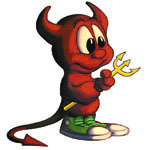 Don't forget to also read up on the section in the FreeBSD handbook: 2.3.7 Prepare the Boot Media. Newer post ← Rebecca Hagelin shoudn’t try economics lah!